At Long Island's Award Winning Sparrow Tattoo we specialize in Replication and Custom tattoos. That means ANYTHING you find, we can replicate: Portraits, Magazines, Photographs, Animals, Paintings or your Friend’s Artwork. If you want something completely never seen before, our Artists will create it for you in ANY style including Realism, Japanese, Black and Grey, New School, Anime, or Classic Old School. A tattoo is a serious commitment; a tattoo is for life so it has to be the right design for you. Before you rush into picking a tattoo, you should seriously consider what you want. That’s why we take the time to discuss, create, and show you exactly what your tattoo will look like before you get it. We also offer laser tattoo removal to aid in covering up tattoos, or to erase that old tattoo you are embarrassed of. We can match any color imaginable with the best quality products available. All Artists are trained in Cross Contamination, Universal Precautions, Sterilization Techniques, and Blood borne Pathogens. 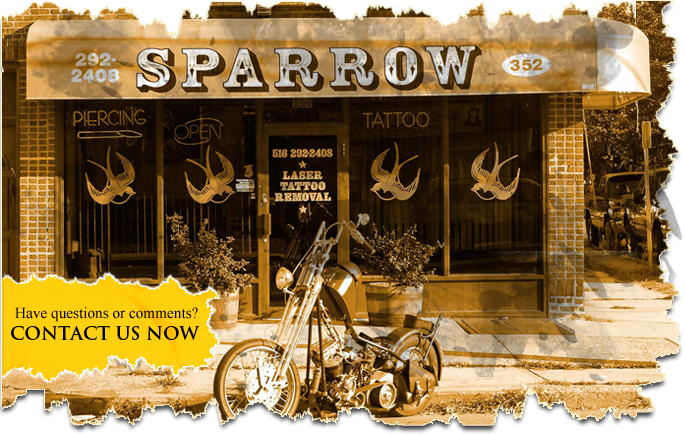 When you come to Sparrow Tattoo, you will know you’re in knowledgeable, professional hands. All Deposits go toward the overall final pricing of the work. We require a $50 deposit to book our time. If the work requires more than one session it is suggested to leave said deposit till the last session, otherwise every appointment will require another deposit. Consultations are free, most only require a half an hour and do not require an appointment. As long as we are here, we will be happy to talk to you. We do require a drawing fee, before we commit our time to creating, drawing and or researching, a minimum of $50 down to show the same commitment toward the project. You MUST be 18 years or older to get a tattoo. There is no parental consent for tattoos in NY.